When we shop for a new car we often forget about what additional inexpensive features can enhance our driving experience, including protection and safety. Car window tint offers a number of benefits, including both aesthetic and protective reasons, as well as offering different levels of tint to suit your budget. 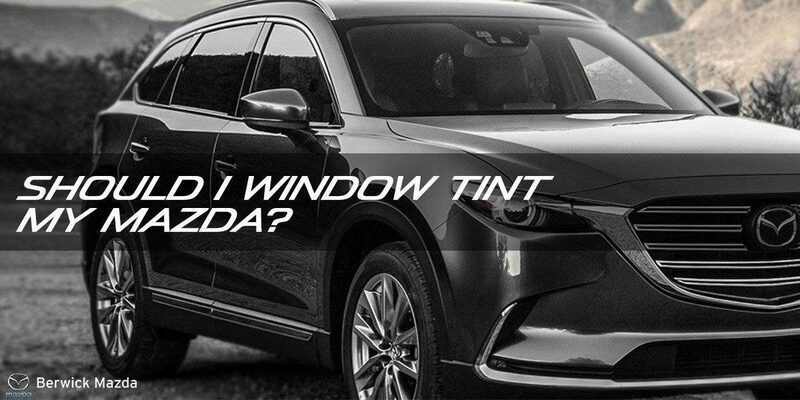 We recommend window tinting as a necessity when purchasing any new Mazda, to protect your family from sunlight, UV rays and other forms of radiation. With genuine tinting by professionals, you can expect the interior to be over 60% cooler during hot and sunny weather. Tinted windows block harmful UV radiations, which Cancer Council has recognized as significant causes of most skin cancers. Tinted windows makes it difficult for thieves to see inside your vehicle, providing additional security. In the event of an accident, tinting reinforces the glass, preventing shattered glass from showering passengers and dispersing around the interior. This is a useful safety measure that protects yourself and your family from shattered glass in the event of an accident. According to Cancer Council, car tinting can reduce dangerous glare from the sun by 60%. This ensures clear, uninterrupted viewing, day and night for safer driving. Window tinting offers the same protection from UV rays to your Mazda interior as it does to occupants, when parked outside during daylight hours. Window tinting is a low-cost measure for enhancing your vehicle’s look, its value, and for protecting your family from sun exposure. With a number of tinting products in the market to suit different needs, our Aftercare Consultant, Ena, has your questions covered. Send an email to: aftercare@berwickmazda.com.au or call us on (03) 8796 6222 for more information.